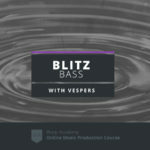 In a recent video we covered the new Max 4 Live Bass Synth with the new Ableton Live 9.5 update. If you didn’t get a chance to catch the first video, here is the link so you can get up to speed. In the patch in the first video, we used a couple Audio Effect Racks that were fairly integral to the final sound. As promised in part 2 we’re gonna dive into the racks, breaking them apart step-by-step, and deconstruct them so you can see exactly how they are put together. Lets check them out! Inside the rack are 2 chains. What this rack is doing is a multi band split, so we can process the lows and highs separately. Pro-tip: Split your signal into bands and custom tailor effects chains to each frequency. Inside of the Lows change is an EQ eight and we have the EQ eight rolling off anything above 122hz. This is macro mapped to the crossover frequency. Afterwards I have placed a Utility plugin which is converting the low end into mono, with the width control set to as narrow as it can go. On top of that we have a Compressor, which is reading a side chain input from kick drum in the track, effectively knocking the low end out without affecting the mids and the highs. One of the nice things about having the Multiband rack setup like this is that you can side chain compress just the subs, for example, while leaving the rest of the bass intact. If you open up the highs chain, you’ll see a rack within a rack. This Highs rack uses Phase Cancellation, and there is some inherent downsides to using Multiband racks, in that if you are using EQ’s to narrow things out and to create the bands your invariably going to get some type colouration to the sound. You might get some notching or frequency build up. What we are doing here is using Phase Cancellation to get a perfect split. I can’t take credit for this, it was Mr. Bill that came up with this initial idea. It’s really unique because it will work perfectly for two bands, so it won’t work if you had 3 or 4 bands, but it works really nicely for this dual band setup. Pro-tip: Use the Phase Cancellation Rack if you want a perfect two-band split. Now let’s take a look at each of the two chains inside of this Highs rack. Looking at the Highs Pass this is actually the full range signal coming into the input of the rack. Here we also are adding a little bit of Chorus, and I have macro mapped the wet/dry of the Chorus to the front panel on the macro. This is very useful for widening and thickening of the mid and high range of the patches. The second chain in this rack is the Lows Phase Cancel band. This is taking the exact same EQ as are on the lows, and the frequency is macro’d to the front panel to the crossover. Right after the EQ is a Utility plugin and it’s inverting the phase. This is feeding in the full range signal and its going to phase cancel out the subs below this eq. The reason why this works is because it is set up exactly the same as the Lows. The lows are going to pass clean, the highs are going to have the highs removed and everything that is not captured by the EQ is going to pass perfectly to the highs pass. This is a really neat innovative way to create a perfect multi band split, and this rack is included in the downloads! The bass processing rack is a more complicated rack, as it contains more effects, but in some ways its simpler as it’s all in one chain. Expanding the chain you’ll see first up we have a couple of Saturators, the first is set up in Analog Clip and the second in Medium Curve. The most important thing to point out is that they’re both running in parallel at 50%. From my experience, with sound design, this the best way to set these guys up. If you set the wet/dry to 100% and push the drive up, a lot of times you will get over saturated and over distorted sounds. Saturation to me sounds way better and fatter when using saturation in layers, allowing some of the dry signal to pass through. Rather than using one saturator and having it do a lot, I’ll use multiple saturators in a row and just add a little bit with each one. Pro-tip: Add saturation in layers using parallel processing, 50% wet/dry and use multiple Saturators, as inserts, layering in the harmonics gradually. The Bass Processing Rack has a few macros mapped to the front panel. The analog clip macro is control the first saturators drive, you’ll notice that it is also mapped to the output gain. As I turn up the drive, the output gain, gain stages down. That’s because saturation adds volume and amplitude to the sound, and I don’t want to fool my ears. Your ears will always think that something that sounds louder, sounds better. When you play the sound you can hear it is definitely getting a bit more crispy and you can use your ears to judge whether or not it makes the sound better. Saturator 2 is set up very similarly and allows you to turn the macro knob up and not have your judgement of the sound impaired. Pro-tip: When adding saturation, gain stage down the output to make an objective judgement about the effect. Next up in the chain is a Multiband Dynamics device and this is doing a few different things. We started off with the OTT preset, and is a fairly aggressive type of Compressor with very hard ratios. Set up here is a parallel and macro named Compress which is mapped out to the device’s amount and it’s set to 50/50 in the mix with wet and dry signals mixed together. There is also a macro called HiFi, and what this is doing is playing with the relative levels of each of the bands. Turning this macro up will turn up the top band and the bottom band more in comparison to the mid band, given you the effect of scooped mids. If you want to make up the gain of the mids or boost up the mid band that is being scooped, you can play with macro named Mid Boost. This gives us quite a bit of control over the final sound using the multi band dynamics device. Next up on this chain is a rack inside of a rack, called the Dimension Expander. I’ve always been a really big fan of the Dimension Expander effect inside of Native Instruments Massive and I feel like I’ve done a pretty good job of recreating that here. Opening this up you’ll see a filter delay. The sound of the Dimension Expander is a effectively a very short slap back delay where it emulates the sound of the source signal hitting nearby walls and then coming straight back at you. Usually this is altered a little bit by an EQ to give you a bit of stereo left/right difference. Both the left and right channel are engaged, the middle channel is disengaged, macro’d to things like feedback, volume and the level of the dry signal. You can use this Dimension Expander rack itself, save it and use it as an insert in your own music. I have a couple key parameters mapped to the front panel. The delay volume is mapped and the size which is controlling the un-synced time, different in the left and right channels, again enhancing the stereo effect and I find it’s a really great way of widening basses. This adds a wonderful widening effect and puts the bass in some acoustic space and gives it a sense of ambience. Pro-tip: Use a Filter Delay to add stereo width by filtering & timing the left and right channels to create a subtle to extreme inter-aural difference. The final effect of the chain is the M4L Convolution Reverb Pro. It’s my go-to Reverb for mixing. I love the realistic character of the sound and the ability to control the reverb with advanced parameters, like panning, full damping control, shape control and reverse impulse response. I’m using it in a mode that I find particularly useful for bass. Inside of the experimental folder there is an algorithm called Club Ambience. The impulse response is 0.1 seconds it’s very short, and it literally just makes it sound like it’s in a night club, and gives you that tight reflection kind of vibe. I’ve macro mapped this to the front panel for reverb wet/dry. I’ve also given this a little bit of Predelay, just so that the sound retains that little bit of in your face kind of feel. Pro-tip: Add some Predelay to make a sound feel closer to you, while still having a sense of acoustic space. There you have it! Used together these two racks are some seriously badass sculpting weapons.